The world’s largest nuclear-powered icebreaker “50 Let Pobedy” will make five tourist voyages to the North Pole this year. The first of them is scheduled for mid-June, the last — for August, according to the information given to TASS in the press service of Atomflot. “50 Let Pobedy” has being conducted cruise voyages to the North Pole since 2008. The nuclear-powered icebreaker “Yamal” worked on the tourist route till this time. And for the first time to the northernmost point of the planet tourists were brought by the nuclear-powered ship “Rossiya” on the 8th of August of 1990. Cruises are very popular, mainly among foreigners. According to the earlier information of Atomflot, tickets are sold out for a year ahead. The journey takes about 11 days. It takes about 5 days to reach the geographical point of the North Pole, and then the icebreaker visits islands of Franz Joseph Land archipelago. 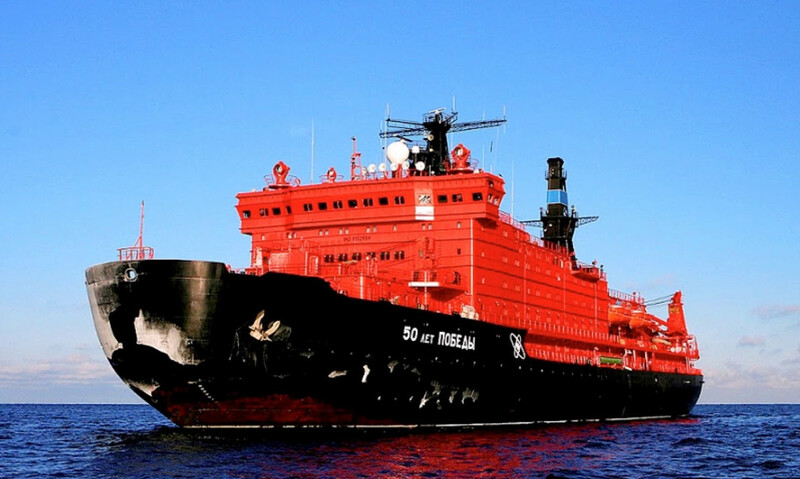 “50 Let Pobedy” is the largest nuclear-powered icebreaker in Russia and the world. Previously it worked in the Arctic for icebreaking support of vessels for such projects as “Yamal LNG”, Novoportovskoye field and “VostokCoal”. Together with the nuclear-powered icebreaker “Vaygach” the icebreaker “50 Let Pobedy” provided the first call of the gas tanker “Christophe de Margerie” to the port of Sabetta and in the opposite direction.